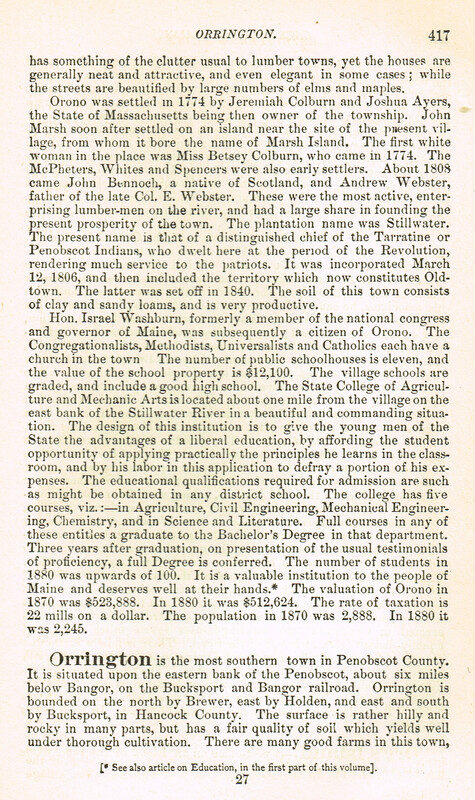 The following is an excerpt from A Gazetteer of the State of Maine, with Numerous Illustrations (1886) by Geo. 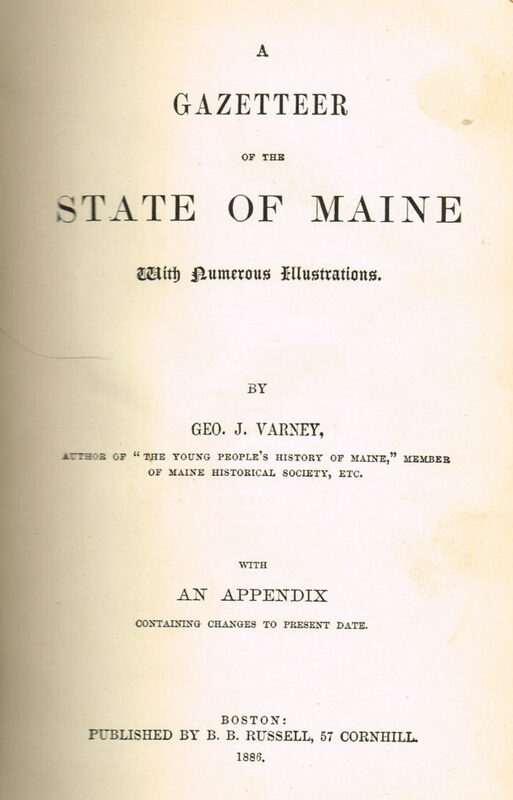 J. Varney, author of “The Young People’s History of Maine,” member of Maine Historical Society, etc. Transcribed by P. Bickford-Duane, August 2016. Orrington is the most southern town in Penobscot County. It is situated upon the eastern bank of the Penobscot, about six miles below Bangor, on the Bucksport and Bangor railroad. Orrington is bounded on the north by Brewer, east by Holden, and east and south by Bucksport, in Hancock County. The surface is rather hilly and rocky in many parts, but has a fair quality of soil which yields well under thorough cultivation. There are many good farms in this town, and many very attractive residences. A drive along some of its roads is delightful. Orrington Great Pond, formerly Brewer Pond, lies on the eastern line of the town, and with a smaller connected pond on the north, gives a water surface of about 10 square miles. It discharges through Segeunkedunk Stream into the Penobscot in Brewer, just over the north line of Orrington. This stream furnishes at East Orrington power for a saw-mill, and a short distance below for a shingle-mill and tannery; then by successive falls, for two grist-mills and another saw-mill. In the southern part of the town lies Sweet’s Pond, smallest of the three, sending its overflow into the Penobscot at the village of South Orrington. At this place are two lumber-mills and a grist-mill. Other manufactures in the town are drain-tile, earthen-ware, churns, boots and shoes, etc. 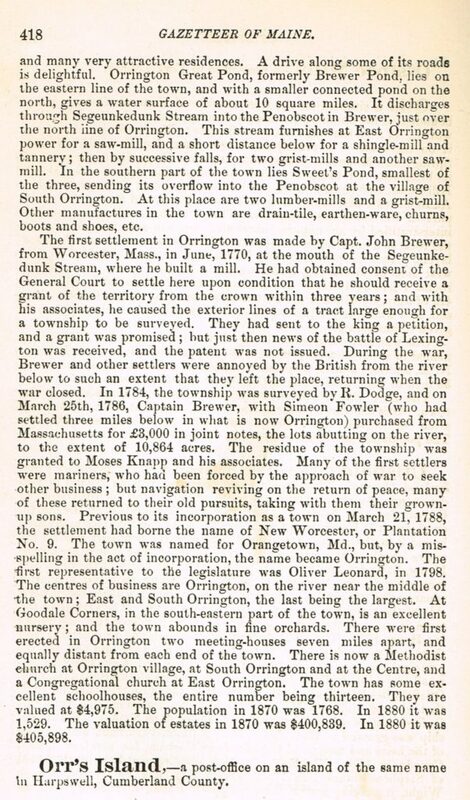 The first settlement in Orrington was made by Capt. John Brewer, from Worcester, Mass., in June, 1770, at the mouth of the Segeunkedunk Stream, where he built a mill. He had obtained consent of the General Court to settle here upon condition that he should receive a grant of the territory from the crown within three years; and with his associates, he caused the exterior lines of a tract large enough for a township to be surveyed. They had sent to the king a petition, and a grant was promised; but just then news of the battle of Lexington was received, and the patent was not issued. During the war, Brewer and other settlers were annoyed by the British from the river below to such an extent that they left the place, returning when the war closed. In 1784, the township was surveyed by R. Dodge, and on March 25th, 1786, Captain Brewer, with Simeon Fowler (who had settled three miles below in what is now Orrington) purchased from Massachusetts for £3,000 in joint notes, the lots abutting on the river, to the extent of 10,864 acres. The residue of the township was granted to Moses Knapp and his associates. Many of the first settlers were mariners, who had been forced by the approach of war to seek other business; but navigation reviving on the return of peace, many of these returned to their old pursuits, taking with them their grown-up sons. Previous to its incorporation as a town on March 21, 1788, the settlement had borne the name of New Worcester, or Plantation No. 9. The town was named for Orangetown, Md., but, by a misspelling in the act of incorporation, the name became Orrington. The first representative to the legislature was Oliver Leonard, in 1798. The centres of business are Orrington, on the river near the middle of the town; East and South Orrington, the last being the largest. At Goodale Corners, in the south-eastern part of the town, is an excellent nursery; and the town abounds in fine orchards. There were first erected in Orrington two meeting-houses seven miles apart, and equally distant from each end of the town. There is now a Methodist church at Orrington village, at South Orrington and at the Centre, and a Congregational church at East Orrington. The town has some excellent schoolhouses, the entire number being thirteen. They are valued at $4,975. The population in 1870 was 1768. In 1880 it was 1,529. The valuation of estates in 1870 was $400,839. In 1880 it was $405,898. Transcribed by Anne (Bowden) Allen from Henry Buxton’s column for the Bangor Daily News. “George Brooks’ gift as a craftsman revealed itself almost immediately after settling in Orrington. He built himself a blacksmith shop and did all kinds of blacksmithing for his neighbors. I have some of his tools made from iron imported from England. he also tanned leather for the other settlers, and set up a Dutch windmill. In company with a neighbor, Simeon Fowler, he made a kiln or two of bricks every year. He manufactured his own charcoal, and made all of his own nails. He built the first grist mill in Orrington. “He was a strong, capable character all around, according to the records that have come down to me, and there was much grief at his death in Orrington, December 15, 1807. Before he died, he built a comfortable farmhouse for his family. After his death his widow was married for the third time to Deacon Mark Hatch of Castine. She was famed over the countryside for her grace and beauty. She died March 2, 1817, at the age of 68 years. “After my great grandfather’s death, my grandfather, James Brooks, took over the farm and carried it on. On the place he built a substantial brick house in which I was born.